If you google 'how to hack FB account' you will find several ways to hack your account. A hacker can use several ways to get your account control from phishing, keylogging, or as simplest resetting your password. And to fight against these attacks, I have recently published a page that you might like to read; Top 12 Best Ways To Identify & Protect Against Phishing Scams | Email Phishing Prevention. Each Facebook account contains a lot of personal information, if it gets public it would cause misuse of information & even furthermore blackmailing. So security for Facebook accounts is the prominent issue these days. Prevention of hacking and making your Facebook account secured is always better than blaming the Facebook system or hacker. If you have not kept your account secure, then it will be then available easy to hack. So in the entire secure environment for your account, you have chances to get your account hacked. Here the Facebook privacy settings explained & if you follow some instructions and recommendations listed here to change Facebook security settings; you can keep your Facebook account safe & secured from hackers. These are remarkably simple things and will certainly make your FB account safer & increase the strength of your accoabout going to address. Check the fundamental things you need to follow to modify Facebook security. Make sure that your password containing about 8 characters. It's assumed that min 8 character password is stronger. Longer password would help you to have a strong key as it takes more time to hack it. Make password which would be difficult to guess. Please avoid including the username, pet name, birth date as your password, you can also use some online password generators but just make sure it's secure & trustworthy. Don’t use the same password anywhere else. Also, change your password once every six months not only for Facebook but everywhere. Go to; Settings >> General >> Password >> Generate STONG PASSWORD. Confirming your mobile number strengthens the FB security. This helps you when you forget your account password; since the Facebook will send you OTP to your mobile number & you can reset your FB account password. Go to; Account setting >> mobile >> add a phone number. Always keep an eye on every app, device, system or browser you are surfing your FB account. Just make sure you are browsing from a secure page in the browser. The Facebook provides you this option excessively. By the secure browsing option, you can automatically limit and control all the external applications which you are integrated previously while logging in with the Facebook. For any activity via your FB profile, these apps would require your approval. Setting >> Security >> Recognised Devices >> check all the devices >> confirm your identity & remove any unrelated logged in devices >> save changes. 4. Activate code generator & login approval. The 'Login Approval' option is the new security feature provided by the Facebook developers; it will need the security pin every time when you are trying to login to your FB account. Go to; Settings >> Security >> Login approval >> Edit link >> checkout box to activate login approval >> save changes. After this Facebook asks you to go for set up, you will receive OTP on your mobile no & generate a code. If you aren't able to get this option for your account; then please make sure Settings >> Security >> code 'generator' is NOT enabled. By this option, you will get login access codes through your mobile number either by text message or FB app. To allow this open the 'Code Generator' section, click the option 'get codes' enter your FB password & click 'submit'. 5. Remove previous activities & past sessions. Now all past activities will be listed, click 'end activity’ to kill all the activities that you feel unwanted. It's always better to go for a security checkup. Click on the settings shortcut & select the privacy option. This option is used to control the exposure of all your posts; manage the audience for your all post. Try to make all your personal stuff (including photos and post updates) visible to all your friends whom you trust. If you allow this option to everyone, you are ready to get unwanted and unknown friends requests. And by unknowingly you used to accept, and they lead to get all your info & might be used against your account hacking. Go to Settings >> Apps >> App settings >> This app-option allows you to control the apps which are connected to your Facebook account. If you see any suspicious apps in the list then don't hesitate to remove it. Moreover, you also need to check more in profile option; you will see most of the options related to your profile display shown publicly; that includes your email ID, birthday, hometown, current city, etc., you can rather, I suggest to limit the audience for your Facebook profile data. Avoid clicking/sharing the spam links on your own Facebook posting as well as opening the links from other's postings. There are many attacks occurred including money scams using Facebook messages, chats, etc. These spam links are or might be the phishing attacks and it will redirect you to the fake website with the use of malicious link & HTML; that can steal all your personal information or even more, it'll damage your device. There is also a chance that you will see that email came from Facebook but actually, it's come from the phishing website. So for security reasons, never click the suspicious links. Never give your username & password to any website while responding to any emails. Facebook or any social networking site never demand your password. For any Windows; always try to update your browsers to the latest version to ensure your browsers security. There are some manageable security & privacy settings from which you can ensure the security of your Facebook. First of all set the 'Login Alerts'. You can decide to get login alerts via Facebook notifications via text messages, email. Get a warning when anybody logs into your account from an unrecognized device or browser. Go to Settings >> Security >> Login Alerts >> edit & select the mode of getting notifications. The next important option is choose trusted contact who can surely help you if ever have trouble accessing your FB account & never accept any friend request from unknown people. 9. Keep updated & secured system environment. Use up to date antivirus software. The updated antivirus software will help you to keep your computer more secure & safe. Try to scan your computer system for malware regularly. FYI; you can have malware even if you just watch a video via FB post, or if you visit a website claiming to offer special features, or by downloading any via the unsecured browser. So please be aware of such things. 10. Follow the best & secured practices to use FB. Don't share the password with anyone. Clear all history from the device. Always log out. Log out even from your own mobile in case it might get in someone's hand or even get stolen so there may be chances to get your personal information can be misplaced. Disable the feature "remember password" on the web browser. Type your password only on your own & trusted computers. Otherwise, usually, hackers use keystroke keyloggers which record everything you type even password too. 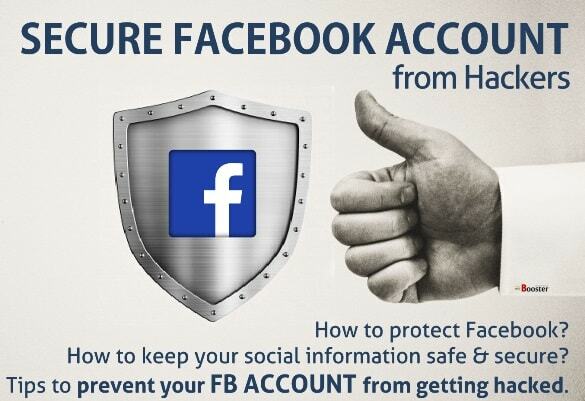 Now with all above options, you will definitely able to make your Facebook account secure & safe than it was. These options would make hacker harder to hack. With these simple options secure FB posting, likes, & comments. Hope this article has helped you not only for making your Facebook account secure but also other social networking accounts.